The following coaches have seen their seasons end, and all of them are being mentioned for multiple openings. Tubby Smith (Minnesota) - Name mentioned with UVA, UGA, Arizona and Bama jobs. Tubby's wife is from North Carolina, and Tubby is from Virginia. He also coached at VCU for 7 years. He's one of the top candidates to fill the Cav's opening if he's interested. Arizona should have their job open by Sunday night at the latest so Tubby is about to be Ground Zero for coaching hot stove talk. Any movement regarding Tubby will be very public given the media attention from around the country. Brad Stevens (Butler) - He's 56-10 in two years as a head coach at Butler. They play an intriguing brand of basketball, but he's very young (32). He hasn't really been associated with our job, but he's one of the hottest mid-major coaches in the country. Lon Kruger (UNLV) - Kruger only makes $1 million a year. As I said earlier, he's a Plan B candidate at Arizona, and he's probably on the list at Missouri if Anderson bolts. With his regional experience at UF and the Hawks, he's someone that logically would get a phone call as a Plan B candidate in Athens. A game to watch today is Tennessee vs. Oklahoma State. We heard an interesting theory earlier this week that if Travis Ford's Oklahoma State team beats Bruce Pearl's Vols; it might spell the end to Gillespie's career in Lexington. Many Wildcat fans would love to have Travis Ford return home, and beating Pearl would set their hearts a flutter. I'm expecting Capel, Anderson and maybe Miller to still be in the tourney on Monday. So their names won't heat up yet. By Monday, the rumors should be running wide open. Good article but regarding Kruger, he's more of a plan D candidate at Zona. Unless their top 7-8 candidates all turn them down, there's no way a big-time program like Zona hires him. I was really disappointed to see VCU last night. I watched them earlier this season against GA ST, but I do not think that was much of a guage. Their offense looked eerily similar to the disjointed trainwreck that we have had to sit through for the last few years. It was basically let Maynor do whatever he wanted and let everyone else try to get rebound scores. It was startling to see the contrast in the UCLA players, none of whom had a tattoo, against the VCU guys, who were inked from head to toe. I know it seems like a small thing, and I am not usually an image guy, but I could never wrap my hands around the idea that Felton was instilling discipline in his kids and making them better men, while at the same time allowing them to brand their hands and necks, something that no reputable employer would ever be able to look past. I also did not like how the VCU kids argued after seemingly every call. The refs were uneven, at best, but Maynor was granted about 6-7 iffy fouls that went against Holliday and Colleson. For him to be barking at the occasional call against him sort of frustrated me. I was really a heavy lean to Grant, but after watching him last night, I fear that it would simply be an extension of the last 6 years, with the possibility of a talent upgrade. Actually, most UK fans don't want Ford for some reason. However, if his team somehow makes the Final Four, they'll be sacrificing babies to the basketball gods and selling valuable thoroughbreds in order to outbid Boone Pickens for his services. Well, OSU did their job. . . I agree with the other comment regarding Grant. That game really soured me. 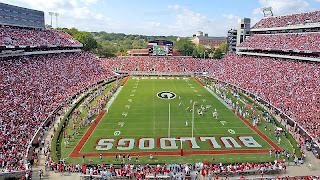 Call me crazy, but I just find his offense unappealing and don't think I could get really excited about driving to Athens to see games in person. I guess that makes me a lousy fan, but it is what it is. Defensively on the other hand, I really liked the way they play. PWD - I was intrigued by the possiblity of bringing in Xavier's head coach Sean Miller to UGA. No mention of it here, has something happened? I wonder if it would be realistic to make a good hard run at Jay Wright at Villanova. Sure, they've got a better program right now than we do, but for all the reasons we've hashed over here before, I just wonder if he might be pried away. He'd be at the top of my list if so. I have no idea why we're not all over Wright. He's not a lifer at Nova, and he's not an alum. his home court seats 6,500, and his practice facility is 1/3 the size of ours and not nearly as nice. There's no way he makes more than $1.5 million. I'd be on him like white on rice. Hi Nice Blog .In this, the body is studied by regions rather than by organs. This is of importance to the surgeon who exposes different planes after the skin incision and who, of course, must be perfectly familiar with structures as he explores the limbs and Knee cavities.